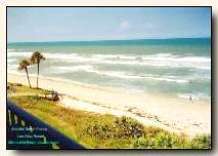 Satellite Beach Florida - Atlantic Ocean - Many Great East Coast Vacation Beaches in Florida! What's New at Affordable US Vacation Beaches? Affordable-Beach-Vacations.com -- and Post on our Wall! Why now an RSS Feed / mini-Blog? The RSS Feed / mini-Blog is usually updated with new Info Items several times a month Vs you only a receiving the e-mailed newsletter every month or two. Now the individual Blog items and Links to expanded Info get to you as they are posted Vs having to wait so long for updates on what's new! The RSS / mini-Blog format is quicker to scan for just the Info you want to read + no e-mails needed. Simpler and takes less time for both of us! See RSS Feed Info and descriptions below + subscribe Link Box below or on left above. Use the RSS Links to subscribe for a free "What's New at Vacation Beaches" Update RSS Feed - mini-blog. New Merchant Coupons as available. You can subscribe to easy-to-join timesaving and brief RSS - mini-Blog -- use one of the links in the box below. (We do NOT need your e-mail address or name for this!) Links are provided to easily add our RSS feed to your existing Yahoo, MSN, or Google personal home page. Click the "What is an RSS Feed?" link below for more Info and if you have any questions. BRIEF RSS Blog Updates will be posted approximately every 2 to 10 days that you can quickly scan and choose to view beyond the brief headings -- or not. Easy to set up. Then can only click on the RSS mini-Blog Info Links you are interested in - saves time. If the RSS Feed / mini-Blog turns out to be something you are not interested in, Simply delete it in your reader or on your page. Try it out - RSS feeds are actually kind of fun. You will find they save a LOT of "reading" time! To recent "mini" US Beach Vacations Blog post above.